Josh Gordon kicked off his abbreviated 2014 season with a bang, catching eight of 16 targets for 120 yards. In two games since then, however, he has nine receptions for a meager 90 yards. If you traded for him in hopes of securing an elite receiver for the playoffs, he let you down in a big way last week. With the Browns likely making the move to Johnny Manziel, Gordon’s stock gets a shot in the arm. After all, Manziel can’t possibly play worse than Brian Hoyer has this season, especially in the last six weeks. Hoyer is completing just 55.4 percent of his passes and has 11 touchdowns against 12 interceptions. In the last three weeks, crucial games in which the Browns have gone 1-2, Hoyer has been picked off seven times and has not thrown a touchdown. So yes, Manziel would likely cure some of what ails Gordon. But would he be a cure-all, or would his Texas recipes be something of a letdown for Gordon and his owners? Let’s explore. When Gordon first came back, I admit that I, like most of my fantasy-writer brethren, issued a mirth-induced soliloquy, extolling his virtues and the likelihood that he would pick up right where he left off in 2013. We have all had to hit the brakes on that and recalibrate our expectations for Gordon, and it only partially has to do with the quarterback play in Cleveland. Gordon himself admitted that he is out of sync and still learning the Browns’ play calls, and his conditioning looks like that of a player who was suspended for the first three months of the year. Two plays from Cleveland’s heartbreaking last-minute loss to Indianapolis in Week 14 sum up the competing problems with Gordon right now. First, let’s take a look at where he has come up short. The following play is from the Browns’ first possession of the game. They have a 3rd-and-7 at their own 35-yard-line. 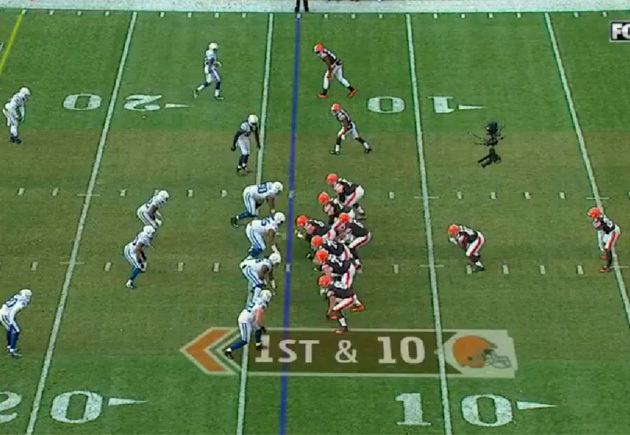 Gordon is lined up to the right of the formation in a wide receiver bunch with Andrew Hawkins and Jordan Cameron. He’s the receiver standing in back of the bunch. Here’s what the formation looks like when Hoyer takes the snap. Gordon gets a clean release and runs a deep square in. He’s bracketed by a corner and a safety, as you can see in the screenshot below. We don’t know the exact play call, but we can be sure that Gordon has two options at this point. He can either sit down right where he is, making himself open for Hoyer, or he can continue with his route, running hard and aggressively across the safety’s face. Instead, he does neither. He takes a few tepid steps toward the middle of the field, then cuts off his route. 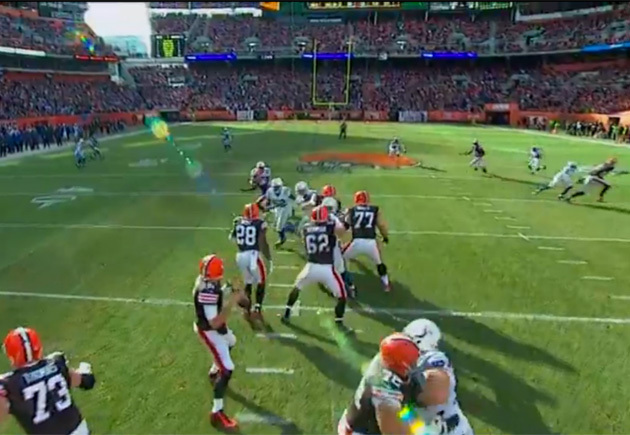 Here’s where Gordon is when Hoyer releases the ball. The arrow is where Hoyer expected him to be. This looks like pure laziness from Gordon in real time, but really it’s another of the many miscommunications that have plagued Gordon and Hoyer. That’s on both players, but Gordon should be able to read this coverage in his sleep. One player is typically more to blame in your average miscommunication, and this time that falls on Gordon’s shoulders. This next play, however, is all on Hoyer. It’s 1st-and-10 with just under four minutes left in the third quarter. 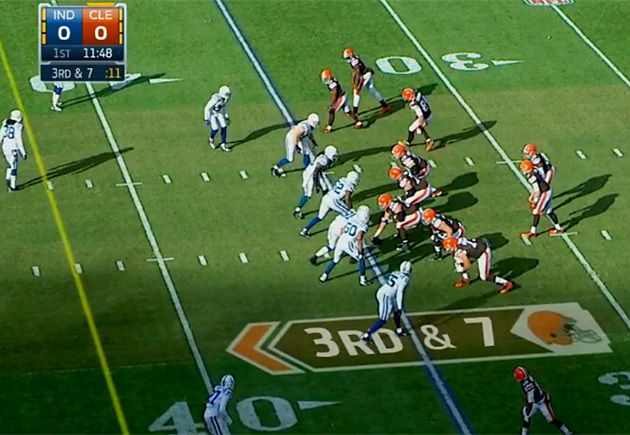 The Browns have two receivers, including Gordon, to the right of the formation. 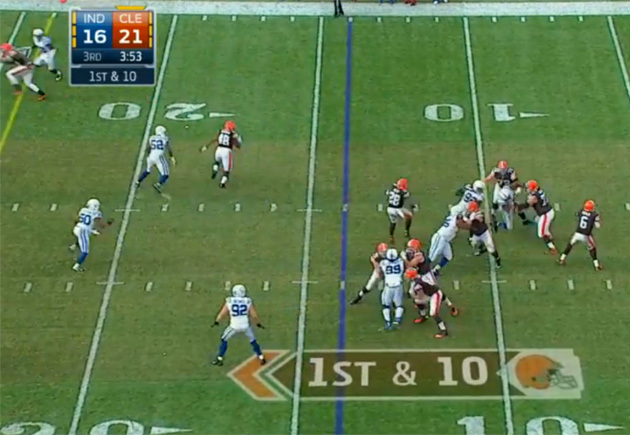 Gordon is outside the numbers, and Jordan Cameron is lined up to the left. The backs are in an I. Here’s what it looks like. Gordon takes advantage of outside technique and immediately beats his man to the inside. At the point when Hoyer loads up to throw, the first screenshot after this paragraph, you see that Gordon already has a step on the corner. 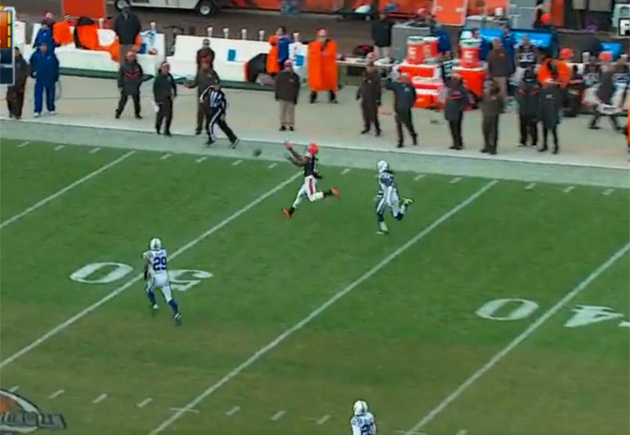 All Hoyer has to do is throw the ball accurately to the sideline and it’s a huge play, almost certainly a touchdown. That score would have made it a whole lot harder for Andrew Luck and the Colts to pull off the comeback win in the fourth quarter. 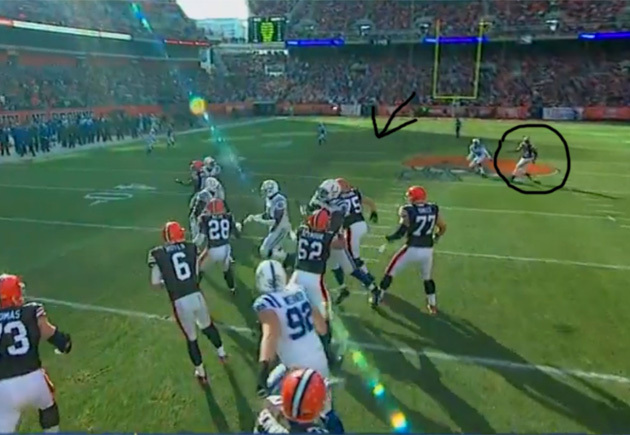 Instead, Hoyer airmails a wide-open Gordon. That’s a throw that simply has to be made. If it is, Gordon’s terrible fantasy output turns into 101 yards and a touchdown. Still, though, Gordon has warts of his own, and cannot be thought of as a WR1 for the final two weeks of the year. For our purposes a WR1 would be a top-12 player at the position. With his own inconsistencies and the ceiling on the Cleveland passing game, how can a fantasy owner play Gordon over Antonio Brown, Demaryius Thomas, Jordy Nelson, Randall Cobb, Julio Jones, Calvin Johnson, Dez Bryant, T.Y. Hilton, Alshon Jeffery or A.J. Green. Those 10 guys are locked in ahead of Gordon without argument. For my money, I’d also rather have the likes of Mike Evans, Jeremy Maclin and Emmanuel Sanders before Gordon. When Andre Ellington left the Cardinals’ Week 13 loss with a hip injury, Marion Grice took over primary ball-carrying duties. When it was announced during the week that Ellington would sit out with the injury, which eventually forced him to injured reserve, Stepfan Taylor was named the starter. It only made sense, then, that Williams led the team with 19 carries and 100 yards in the win over the Chiefs last week. Williams now finds himself as the most attractive waiver-wire option at this late stage of the fantasy season. While you have nothing to lose from adding him at this point, if you’re starting him this week you’re lucky to be alive in your league’s playoffs. Williams hadn’t touched the ball all season before hitting the century mark last week. He will likely remain the Arizona starter for the rest of the season, but that doesn’t make him any more than an insurance policy for fantasy owners. For one thing, there’s usually a reason that a player doesn’t receive one touch until December. He spent most of the season on the practice squad, and was signed off it just 48 hours before the Cardinals took on the Chiefs. That he was able to have a big game on such short notice was impressive, but fantasy owners shouldn’t read too much into it. First of all, the Chiefs feature one of the league’s worst run defenses. After Williams lit them up for 100 yards on 19 totes, they’ve now allowed 1,560 rushing yards to running backs – second-most in the league – and 5.11 yards per carry. He won’t see a defense like that for the rest of the fantasy playoffs. The Cardinals host the Rams on Thursday night this week, then host the Seahawks in Week 16. The Rams have allowed the seventh-fewest rushing yards this year, while the Seahawks are three spots better. Both outfits have surrendered 3.7 yards per carry or fewer. He’s going to have a tough time running in each of the next two weeks, no matter how many times he gets the ball. And even that is an open question, as certainly Taylor, and potentially Grice, will remain involved in the offense. Williams is worth adding in case you end up finding yourself in dire straits in Week 15 or Week 16, but you will not have to plug him into your starting lineup unless you’re saddled with the stink of desperation.